Our quarter ended last Friday and report cards go home tomorrow. 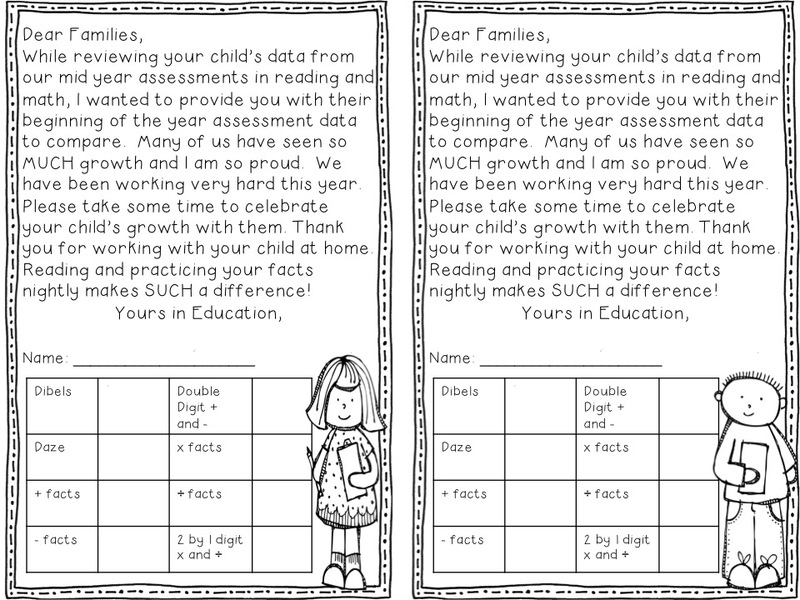 We recently began sending home additional data sheets with our report cards that detail each child's progress on a variety of assessments we give to our kiddos three times a year, think Dibels and a wide variety of math computation tests. Which is great because it keeps our parents informed. However, all the reports show is their child's score and then in big capital letters the words ON TRACK or NOT ON TRACK. No mention of growth from the assessment period before or any mention of the benchmark that determines whether their child is considered on track or not. My kids reading scores in the fall were pretty low. That's what sparked the creation of my fry phrase games and weekly fluency homework sheets. We've been working so hard and many of us made so MUCH growth, but many of my sweet babies missed the winter benchmark score by literally a few words! The words NOT ON TRACK literally made my heart sink. The same was true with our computational fluency. For my sweet babies who answered 20-30% of the multiplication and division timed assessment correctly in the fall and then who grew to 85% accuracy this winter, it felt so wrong to see NOT ON TRACK next to their name. They ARE on track to meet the benchmark sometime this year, just not right now. Once I started comparing their fall and winter data I felt so much better. The amount of growth was amazing and SHOULD be celebrated. Knowing that most of my kiddo's parents didn't hang onto the fall data sheet, I filled out this little form and attached it to the one going home tomorrow. I hope all my kiddos' parents are as excited to see their child's growth as I was! As a class, we have a lot to celebrate and we are ON TRACK. On the track to accomplish great things! That is so sweet! Kudos for taking the extra time to inform parents a little bit more, and celebrate everyday success!! You are exactly right, we need to celebrate the growth. It is so easy to get sucked into all the negativity and all the worry of state testing. I loved your form and pinned it for the future! Lisa~ This is really great! My sixth grade smarties went through January benchmarking also. I thought that they had done so much better than what some of the information provided. It was very disappointing and stressful the way the data was reported to us. Kids went up in one area we focused on and then down in the area that we didn't FOCUS on. FRUSTRATING!! We don't have to share scores out with parents but I was thinking of doing it anyway. I am so glad to be a new follower and so excited that I found your blog! The amount of growth was amazing!